This cool kid birthday party will have your birthday child shining brighter than his armor! So, as King Arthur would have probably said, let the festivities begin! You can really get creative and come up with a bunch of royal knight birthday party invitations. Then roll up these cool kid birthday party invitations, as if they were scrolls, and either tie them with a ribbon, put a sticker to close, or if you want to really be regal, seal them with wax. You can put the scrolls in empty toilet paper rolls with a sealed bottom, and add a construction paper cone to the top as if it were a castle, decorate, and fill with sparkle glitter and confetti. Start with a red carpet leading to your door. This’ll really let the kids feel special. If the kid birthday party is in the evening, you can line the pathway to your house with brown lunch bags half filled with sand and with a candle inside. The bags glow magnificently once you light the candles. For an added magical touch, you can decorate with white Christmas lights. Spread balloons all over your floor and if you use helium then have them decorating the ceiling. To make your home look like a kid birthday party castle, use large pieces of cardboard paper to cut out shield shapes, then use paints or markers to decorate the shields with a variety of royal-looking crests (have your kids help you decorate!) and hang them all around. 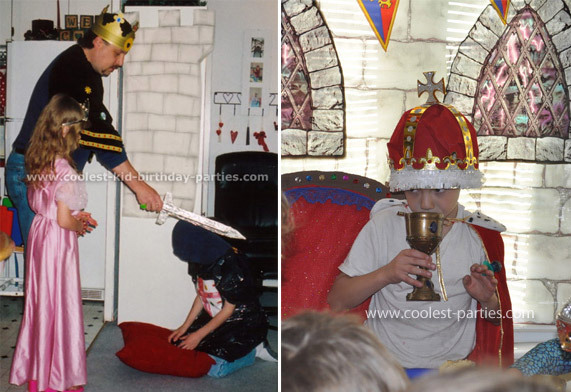 Gather all your kid’s knight-related props, such as a rocking horse, dragons, castles with knights, plastic swords, and any other items that can be placed around the kid birthday party room to create a medieval atmosphere. If you don’t want your home looking like a castle, you can make your own outdoor castle with large appliance boxes. Paint bricks on the boxes to make the boxes look like the outside of a castle. Decorate with pictures of swords, dragons and castles. Here are some excellent castle decorations to help you conjure up more kid birthday party decoration ideas. Make Royal Pennants and suspend them from your appliance-box castle, or from your front door and house windows. To make the pennants, use felt sold by the yard at fabric and craft stores or seamless paper. Cut rectangles approximately 18″ wide, and of varying lengths and at the bottom end cut a notch to create an upside down “V” in the center of the banner. You can also make a royal flag out of construction paper or cloth with a dowel or broom handle. If you’re in the do-it-yourself mood (kudos! 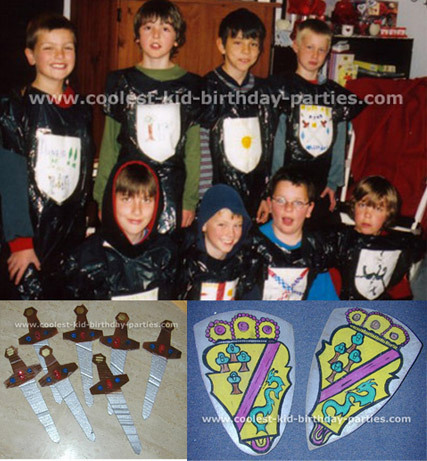 ), you can make your own kid birthday party Knight costume for the boys by cutting out crowns, shields and swords from gold poster board and covering parts of it in foil. On these you can put their names as follows “Princess _______” or “Sir/Prince _______”. You can also give out plastic swords which make a great favor for your knights to take home. Remember to decorate one chair as a throne for the birthday knight to sit in as he eats his cake and opens presents. Upon arrival, the girls can be given princess halos made of wire confetti with pink or purple ribbon wrapped around them. Or, you can prepare princess hats out of plane cone party hats with pink and purple tulle coming out through the top. To the bottom you can glue colored lace with plastic rhinestones. Take a look at all the coolest homemade Knight costumes. As the kids arrive, invite them into your kid birthday party Kingdom. Let the birthday kid lead the ceremony, knighting the boys with a sword (or crowning the girls with tiaras or paper crowns) as they kneel. Announce each royal guest to the others as Sir Knight “Name” (or Maiden Princess “Name”) so everyone can learn one another’s name if they are not well acquainted. Also, if you have a trumpet, blow on it when each new guest comes (or just pucker your lips out to make a trumpet sound). In this kid birthday party activity, the kids make their own little castles. Take baby food jars clean them well and remove the label. You can give the kids colored papers to glue and decorate the outside of the jar. They can paint the lid with silver acrylic paint and glitter, and glue on the top a silver Hershey’s Kisses with their ‘flags’ waving. They can add more Hershey’s kisses in the jar and take it home as part of their Knight kid birthday party favors. Prepare sugar cookies and cut them into the shape of shields, about 6 inches tall and 3 to 4 inches wide. Divide frosting into several bowls (use different hues of food coloring) and have the kids decorate each shield. Provide an assortment of toppings for the kids to choose from. Give each kid two cookies and let them decorate the shields to make their own coat of arms. A great ice-breaker for all parties is to print out some coloring pages! You can put out a few tables with markers, crayons, or anything else the kids can paint with and let everyone color in knight coloring pages until all the guests arrive. For this kid birthday party activity, take popsicle sticks and glue to cardboard with a few rhinestones, glitter, sequins etc, and insert a picture of each child in their costume (using a Polaroid or digital camera). If you’ll be having many girls at the kid birthday party, you can set up makeover stations for the princesses to get the girls looking and feeling regal. For example, at the fingernail painting station you can offer a couple of different colors for the girls to choose from and suitable stickers or glitter to jazz up the activity (allow plenty of time to let their nails dry…). Other ideas for stations can include a hair styling station, a lipstick and makeup station, etc. Take a look at all the coolest homemade Knight birthday cakes. Here also are a cool King birthday cake and a Princess wand birthday cake. Medieval times were known for sumptuous, all-you-can-eat banquets. Prepare a feast of food edible with hands, be creative and have fun! Dragons in a Blanket – Slice hot dogs lengthwise, cut cheese into strips, unroll croissants and stuff them with hot dogs and cheese and then roll the croissants back up and bake until golden brown. Bread Bowler – Take round individual loaves of French bread, slice off the tops, scoop out the insides and set aside the bread for dipping. Fill the loaves with stew, macaroni and cheese or your favorite casserole dish and cover the bread with foil. Then, bake the loaves and remove to set on individual plates. The kids get to open the foil and discover the surprise inside (share the extra bread for dipping). Dig in!! Tip: Allow children to eat on round picnic tables to resemble the Knights of the Round Table. Knight’s Grog: A knight needs a cool and refreshing drink after a hard day of dragon slaying!! Blend 2 liters of ginger ale with 1 liter of apple juice and serve grog in mugs. You can also make grog-cubes by filling several ice trays with the knight’s grog beforehand, and freezing them until cubes are completely frozen. The kids can make their own dark knight drinks. Have them pour lemon-lime soda or white grape juice and then with black food coloring add a few drops. They’ll see how the juice becomes dark with black swirls… they’ll love it! Trinkets you can include in the favor packs can include knight stickers, a plastic sword, dragon items, castle items, medieval tattoos (for the girls you can add bracelets, jewels, ring-pops, magical wands, body glitter, etc.). You can also include homemade certificates for each of your guests, proclaiming them ‘Shiniest Armor’, ‘Best-Mannered Princess’, ‘Jester in Training’, ‘Knight Most Likely to Stare Down a Dragon’, etc. A cool activity – have the kids hunt for a dragon (pinata) and once they find it, let them “slay” the dragon and take it’s treasure!